We had the boy all weekend! He was on a Star Wars cooking kick, because his mama got him a really cute Star Wars cookbook and sent it along so we could all have fun! Here, Uncle is supervising while he made Han-burgers (Han Solo). 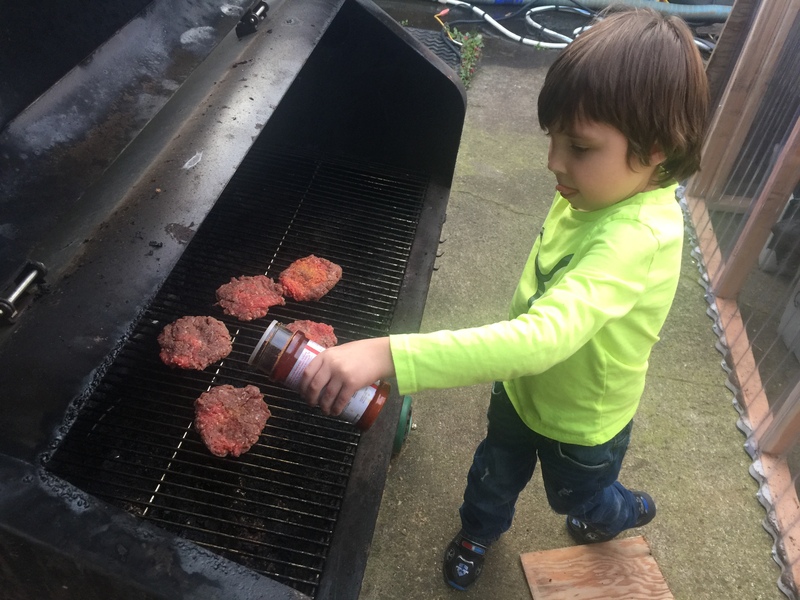 Uncle was even teaching him how to flip burgers! 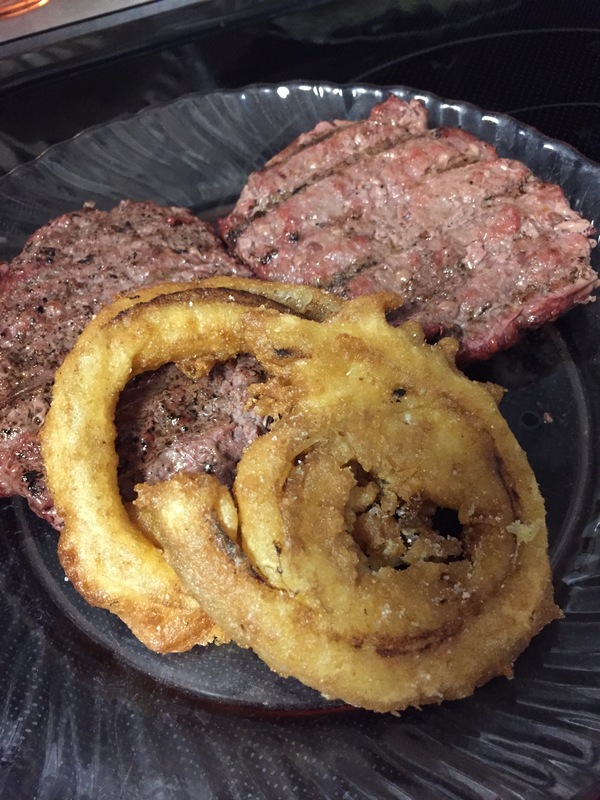 Uncle rose to the occasion and made up some planet onion rings to go with the Han burgers. He used onions that had been given to us last weekend and made a coating with rice flour, egg and water and gave it a Star Wars sounding name. 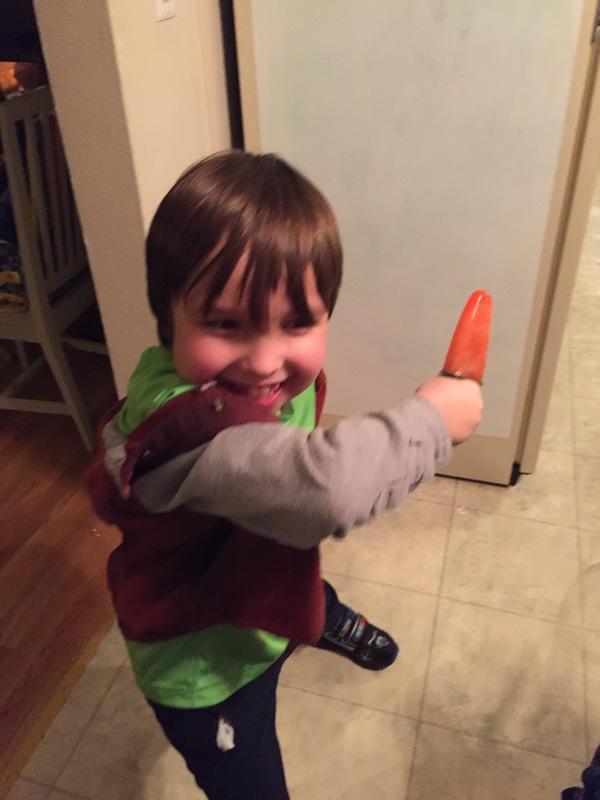 Jedi juice pops were a real hit–literally! They fought with them. 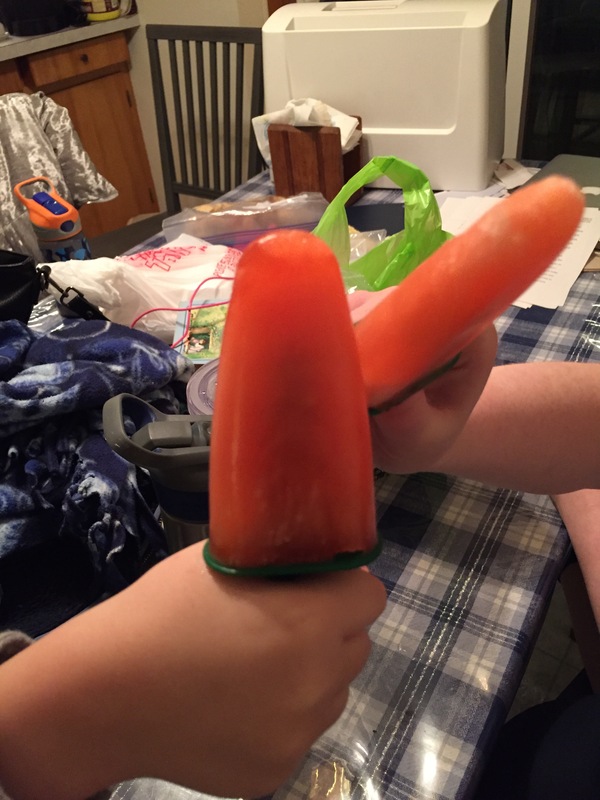 We had to color them red with maraschino cherry juice to make it the right color for the dark side–otherwise, it was just apple juice poured into a popsicle mold. The book had more complicated directions, such as put strawberries and apple juice in an ice cube tray and insert toothpicks when they had frozen for 2 hours……this was easier! That would be a Chewybacca pancake. They were supposed to be C3PO pancakes with pineapple, but that was a no-go. 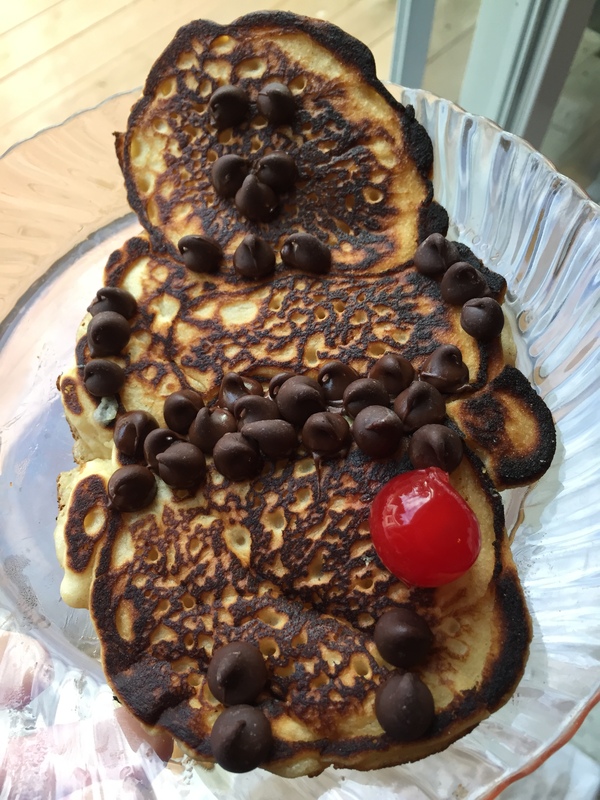 They had to be Darth Vader pancakes at first, covered with chocolate chips for the helmet with a cherry for a lite saber. Of course, we converted everything to gluten-free with the good old Bob’s Red Mill Gluten-Free All-Purpose Flour! These pancakes were really good. Chewbacca got really brown, but Jake thought that was good–he is brown! 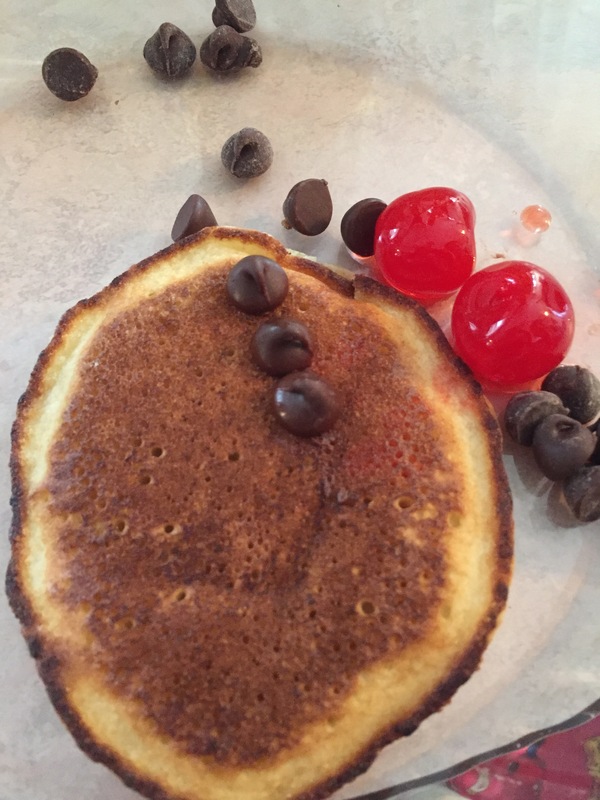 As Jake explained, he wasn’t going to eat any of those toppings….they just made the pancakes look good. Patsy ate them for him. 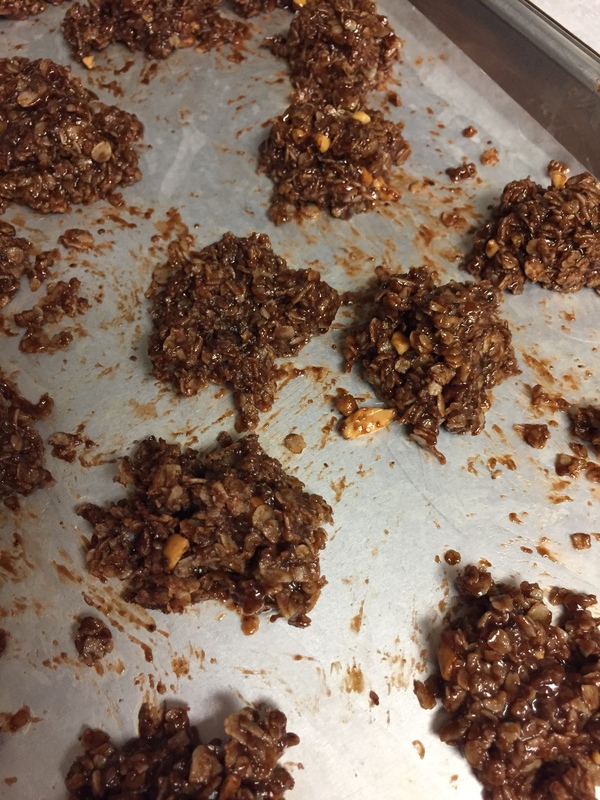 Although the book had a different recipe for Wookie Cookies, Patsy decided to make Mountain Bars (no bake chocolate-oatmeal cookies) and they decided to call them Wookie-Cookies. The Star Wars Weekend was really fun. No matter what we cooked, we gave it a Star Wars name. Jake was super hungry and ate a ton of turkey-rice soup that was supposed to be for lunch tomorrow. No worries–I’d rather have him eat it any time–it’s one of the few real foods he eats–I made an enchilada casserole from odds and ends and we will heat it up with the rest of the soup for tomorrow. Everyone’s coming here tomorrow, as some have meetings and things in the afternoon and need to eat and run. We also drove down to the beach yesterday afternoon for a few hours. It’s really not that far from here–we just usually forget that it’s so close. There was no school Friday, so all the kids and Rob were off, and that’s why we had Jake that day–his mama was working. Rob had done some errands in the morning while I went to the YMCA and took an exercise class. It was a new-to-me one, and said on the description–“Low impact/barre” so I assumed low meant easy and we would hang on to a bar and ??? I didn’t know what, but how hard could it be? Hard. Let’s just say hard. There were resistance bands to work our shoulders and arms, lots of jumping around (with one foot on the floor at all times), and so forth for 45 minutes. THEN we went over to the barre and held on while doing lunges, squats, pulses, etc. for another 30 minutes. Yikes! To make it worse, there was a lady, who had to be close to 80, just going like gangbusters! She was amazing! Again, as usual, pretty humbling:) The teacher was also new-to-me, but she was super helpful and kind, and I hung in there. I was pretty sore all the way to the beach, and beyond. So, I was glad to crawl into the van and let Rob do all the driving. All I asked for was a Diet Root Beer float from A and W, and I was good to go. Ice cream fixes everything! We shall see if I can talk myself into going again next Friday. I also had done my 2 regular Pilates classes earlier in the week, and am hoping to try to do at least one extra class or other exercise time each weekend as well, from now on. I could take classes all day, every day, with our membership, I just don’t have the time or energy. 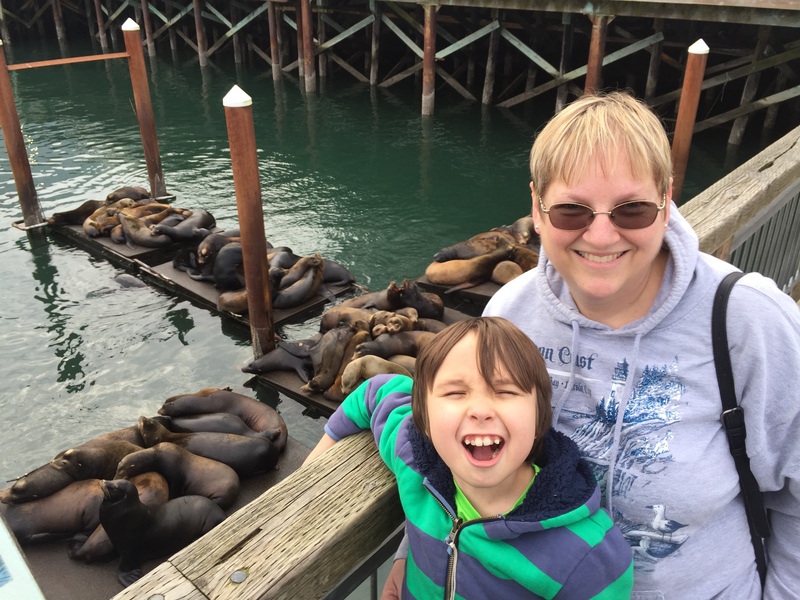 The most fun we had was looking at the seals on the dock at Newport. 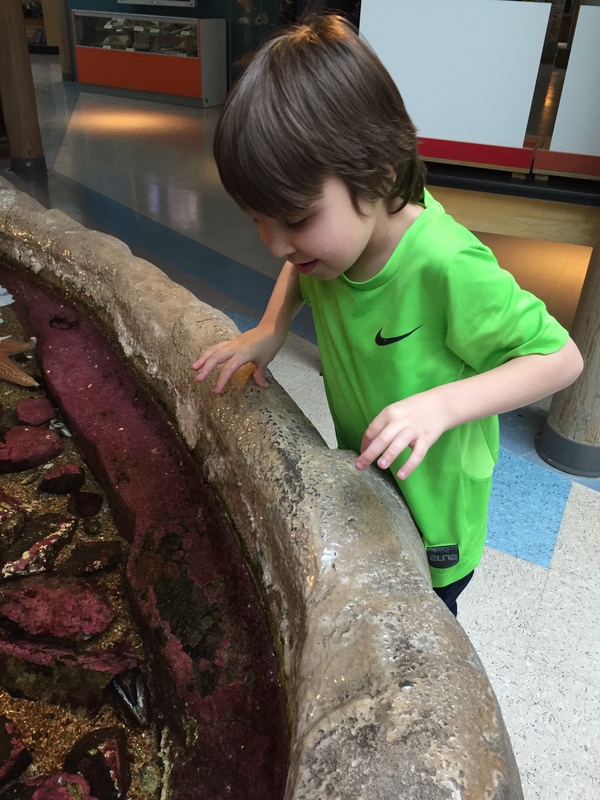 Jake spent most of his time imitating the sounds the seals were making–arr, arr, arr, arr. 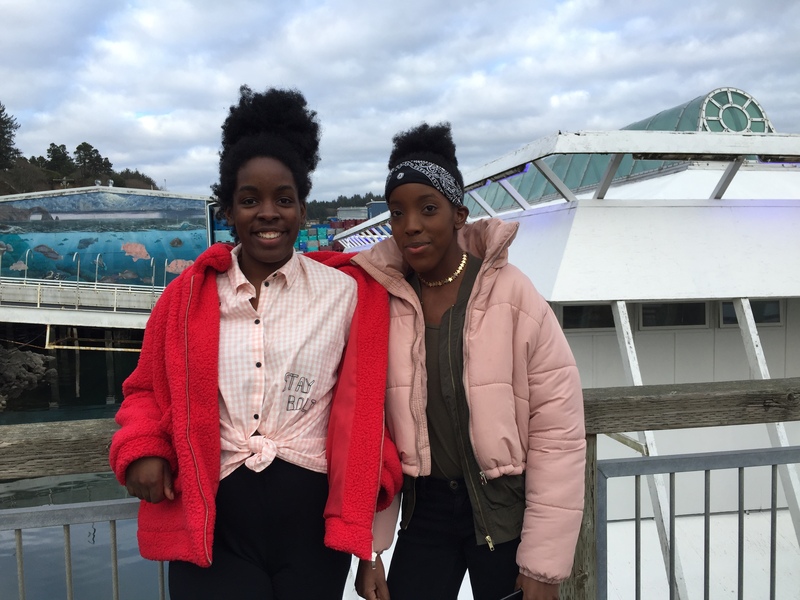 They were so funny, knocking each other off the docks, pushing and shoving like children. Then some college students showed the kids the red rock crabs they had caught, and caught a rock fish while we watched. Docks and kids = Fun! The Mark Hatfield Marine Science Center was near closing by the time we meandered down there, but we enjoyed it for the short time remaining. They are re-doing the exhibits and most of it was closed anyway. It looks like they will have new things to see in a couple of weeks. It was a fun time with the whole family, as the 2 big girls got to go as well. We stopped at a candy shop, and let everyone choose 1 thing. We ended up our evening by going out to dinner; a super fun, rare occasion with the whole family. I had some money that was given to me a while back as a gift, that I used for our dinner out, and was very satisfied with my day! I especially enjoyed the drive up the coast from Newport to Lincoln City, as the weather was nice, and we stopped off at Depot Bay to look around. The spouting horn was not spouting. It was the wrong time, but no one cared. We enjoy looking at the ocean under any circumstances. The entire afternoon was a lot of fun. I need to remember more often that we really aren’t that far from the ocean! The rest of the week was full of normal activities. I went to work, appointments, did homeschool, and let the dishes pile up in the sink and the mountain of laundry grew pretty tall. Then, on Saturday, I tore into the neglected work and did some cooking, cleaning and laundry. I also got some more transplanting done in the greenhouse. I do water the baby plants every single day, no matter how busy I am. One of the biggest ways I’ve saved money this week is by not shopping very much. After spending a whopping $21 last weekend, I never did make it to the store again. And, I still haven’t made it this weekend, either. I do need to stop in after church tomorrow, but my list isn’t very long. I’ve been digging in the freezers and cupboards and feel good about some of the thing that have been used up. I downloaded my Friday freebies from Fred Meyers, but haven’t picked them up, since I haven’t had time to go to the store. So, if you want to save money by not shopping, borrow a little boy for the weekend and you won’t have time to go, but instead, can cook Star Wars food all weekend from pantry staples! It’s more fun than the store, believe me. I planned to clean the fridge this weekend after it emptied out a bit more, and was working hard all week to continue emptying it. This morning, when salsa hit the floor and spewed in all directions, painting the fridge door, wall and floor red….I knew the time was at hand! I washed the entire thing… and the floor in front of it…and the cupboard beside it….and……The food fit easily inside and there was room for leftovers and food for tomorrow’s Family Sunday Dinner. I love having a clean fridge! I was able to pull a few more green onions that had overwintered in the garden and use them in the casserole I made. I used some turkey bits from the freezer for both the turkey-rice soup and the enchilada casserole. This turkey was cooked last summer, and needs to be used. I used home-canned chicken broth in the soup. We used some frozen corn my sister grew and froze, for us, last summer. 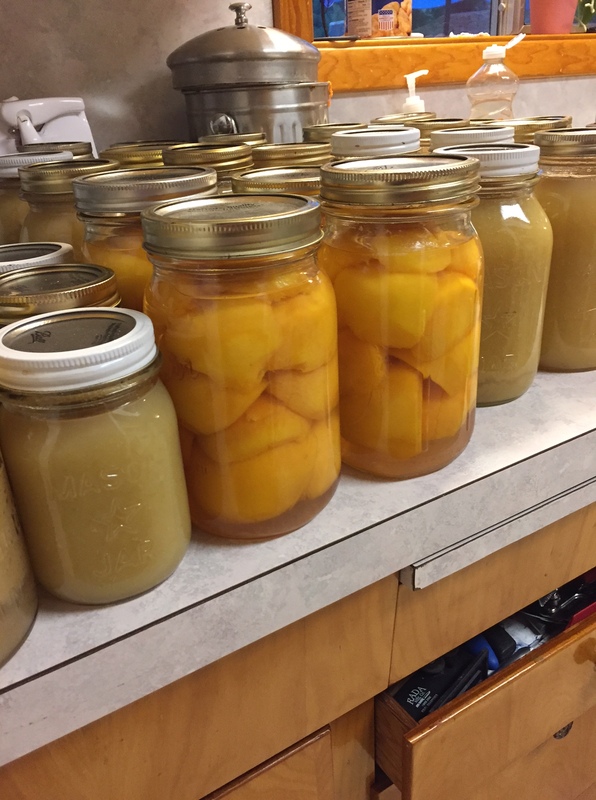 I’ve been offering the family canned peaches frequently, and there have been takers, as the fresh fruit is mostly gone now. The applesauce is going down the hatch, too. I will likely pick up a few bananas the next time I make it to a store. I still have carrots, celery, and of course, onions to cook with this week, as well as some lettuce, still looking great, from that huge package I bought at Costco a couple of weeks ago. I am surprised at how things have held out with as little shopping as I have done the last couple of weeks. 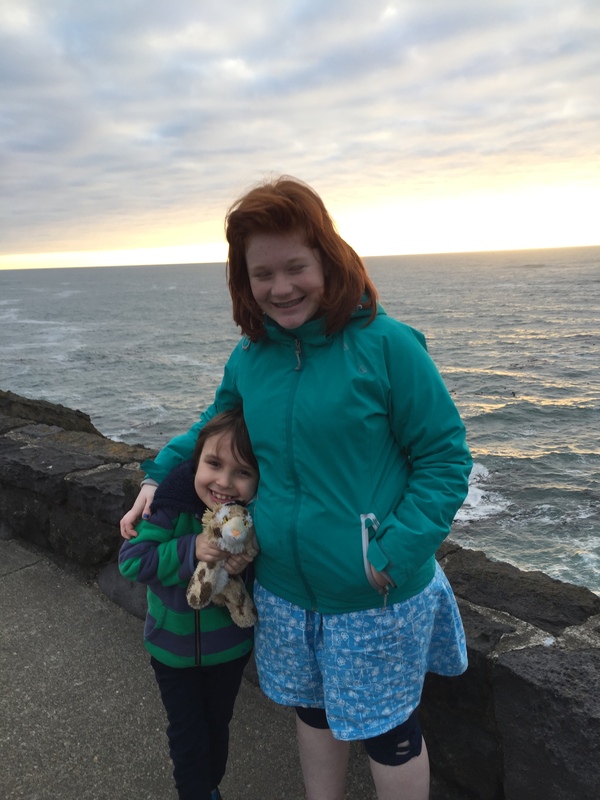 I am delighted that I have been able to meet my goal of completely paying off the rest of Patsy’s braces–what a great feeling. I thought I had held out plenty for groceries, and it’s turning out that I may even have some left to roll over to next month (which starts mid-month for me, as that’s when I get paid). We’ll see, as I noticed the evening Melatonin/Sunthenine bottle is getting empty, and that stuff’s expensive. But, it works to help both Patsy and Jake go to sleep, so…..cheap at any price:). What a fun weekend! All that Star Wars cooking turned out well! I bought Rice Krispie treats BOGO and cashed in KFR points for a $1 coupon so they were 50 cents so now I can spread out the treats for when I want just one. Your coast is so different from the east coast. It looks so wonderful and much more interesting. I really hope to see it some day I grew up 60 miles from Daytona Beach and when I was in high school and classes were over for most seniors at 1 PM we hopped in cars and went to the beach at least once a week. Bathing suits, towels and Hawaiian Tropic were kept in our cars so we could go anytime. We just had to be home in time for supper. Yesterday was the first day I touched my March food budget so I suspect I will roll a good bit into April which is fine with me. I sat 2 bags of mealy apples out on the counter from the fridge and told hubby to throw them in the compost. After a nap I thought better of it since they were still firm and seemed good so I made some applesauce and canned 4 jars. It is really good applesauce. Friday I made a crockpot full of beef stew only using 1 pound of meat and that will feed us three times. We prefer veggies to stew loaded with meat. I am loving cooking something big on Friday to last the weekend. We are back to rainy and cold so it has been really good. I am wondering if it will ever warm up here. Last year it was cold into June. It sounds like you had a fun time when you were a teen! It sounds like you got some great prices on Rice Krispies! The applesauce sounds really good, too. The weather today is so beautiful. I think spring is back for a couple of days here. That is very welcome to me. I don’t blame you for wanting spring there! I’ve never seen the east coast, and would like to see it, just to see it, one day! I’ll have Rob ask the girls at work. He works with several young Hispanic girls who are always asking him for recipe suggestions, since they claim they are tired of eating Mexican food all the time. He LOVES Mexican food, and now one of their mothers is promising to teach him how to make it the right way. I’m cracking up! Anyway, they might know. Or not. It’s worth a try. Star Wars theme – how fun. It all sounds like such a laugh and good tasting too. So nice for all the schoolers to have a day off and enjoy so fresh air at the beach. At this point, we can make regular food and call it a Star Wars name and he’s happy:). That makes it even easier! Thank you. It was really fun! Your beach pictures are stunning! 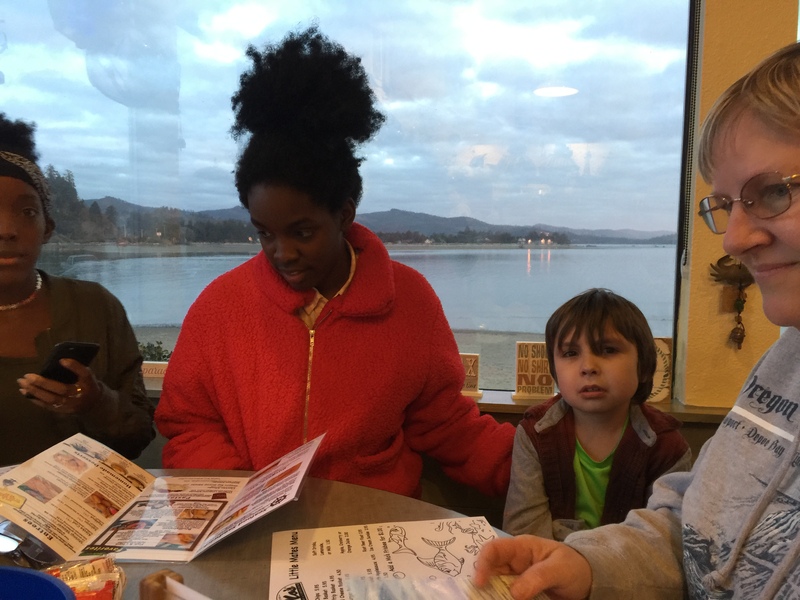 I love to see them, like a reader said before, it is so different that the coast I am used to….I am used to the Gulf of Mexico, the northern Florida panhandle, and the Alabama coast. I also loved the pictures Jake cooking! Your hamburger looks delicious. Thank you. It was just so fun to see him having so much fun. 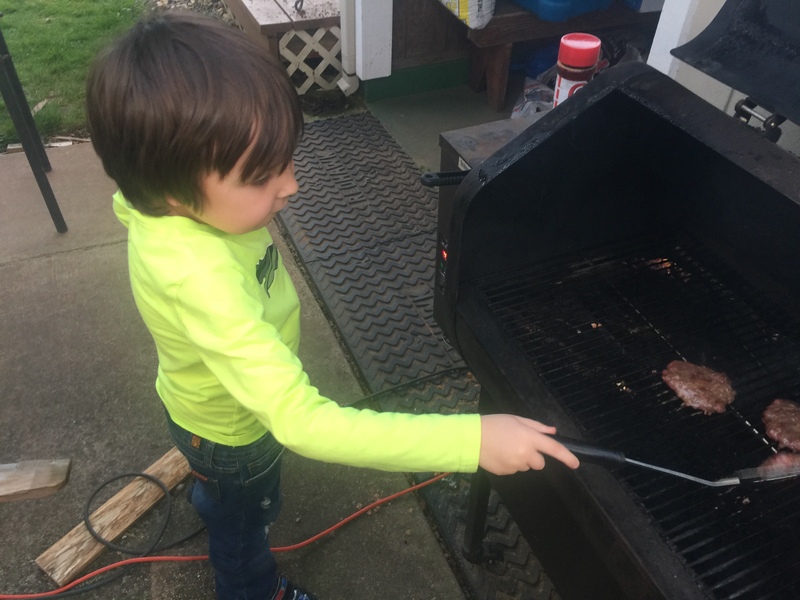 I guess he is going to be a BBQ guy like his uncle, although he has gravely explained to me he’s making those burgers for everyone else…he wants soup and nothing but soup (and bagels)! I won’t argue and will make all the soup he will eat, as it’s really the only healthy food full of veggies he eats. Sounds like you’ve had a wonderful time with the Star Wars themed foods! Well done on keeping the grocery spending low and paying off the braces! The best part is how much fun you manage to have even with all the busy-ness of the week! You are an inspiration, Becky. Thank you! I ended up having to go shopping after all, it was almost comical how all of a sudden, many items were empty or gone. So, I emptied out those grocery envelopes after all! 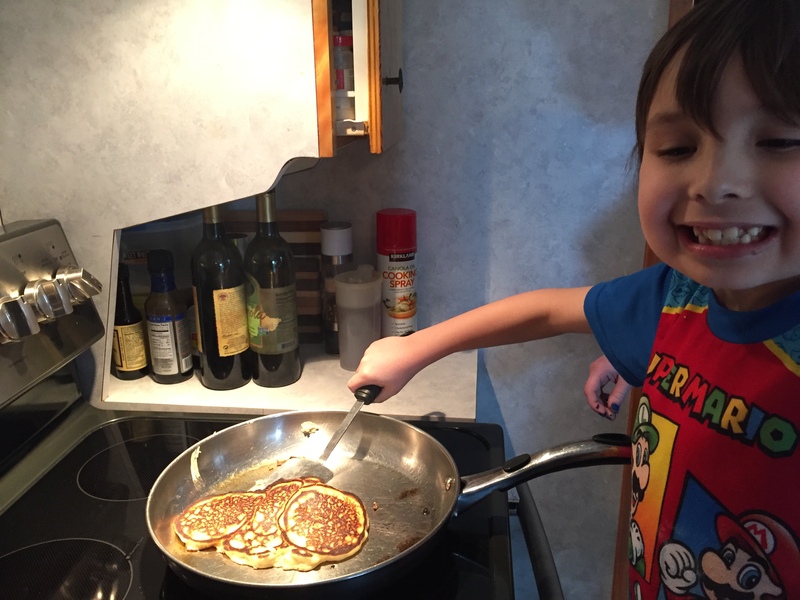 You have to laugh…..
Maybe Jake will be a chef when he grows up. Or he could start cooking the meals for you while you put your feet up. Isn’t that a good idea? Great idea!! Not sure how practical:). He had his big sister so faked out that she really thought everything we cooked all weekend really was from that Star Wars cookbook, but I did explain to her that we cooked a few things with huge modifications, and called every single thing by a Star Wars name! He certainly has ideas about what he wants! Even if he doesn’t want to eat it himself.